Collora, who has worked largely as an effects guy on movies like Predator 2, Guyver: Dark Hero, and Men in Black, followed up his Batman flick with this fan-film trailer for World’s Finest, which also rocks pretty hard (and includes Lex Luthor in his crazy purple-and-green power suit). So when I realized he was the guy behind Hunter Prey, my enthusiasm grew. From the description of the movie, I was figuring it’d be a low-budget Alien swipe, and although it starts out feeling like that’s where it’s headed, Collora and co-writer Nick Damon turn it in another direction pretty quickly. As the movie opens, a military spaceship has crash-landed on a desert planet and the crew’s mysterious prisoner has escaped. The three surviving soldiers call for rescue and while they wait to be picked up, they begin hunting down the prisoner. Things aren’t quite what they seem, however. Admittedly, you can see the end-of-Act-One “surprise” coming from a long distance off, but fortunately Collora and Damon were smart enough not to rely on that, instead allowing the characters to bear the burden. The movie was obviously made on a tiny budget but looks great – the cinematography by Edward Gutentag is terrific, and the costumes, props and weapons are all very cool. The score by Christopher Hoag is excellent as well, and even kicks up a little of the feeling of Jerry Goldsmith’s Planet of the Apes score. For a movie that’s essentially about a couple of fellas wandering around a desert, Hunter Prey is surprisingly entertaining. The acting (the flick is carried almost entirely by Clark Bartram and Damion Poitier) is solid as hell and there are enough twists along the way to really keep things moving. 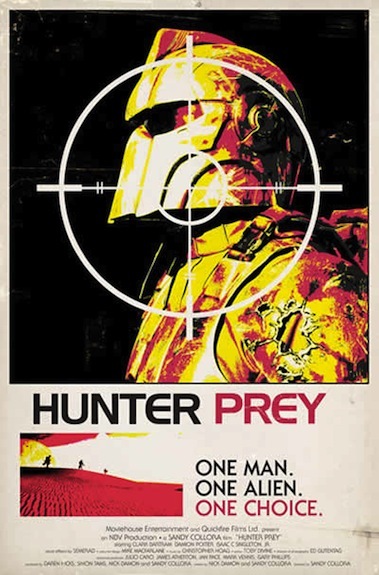 In both the short films above and in Hunter Prey, Collora has a nifty way of directing the physicality of the actors, getting a real comic book feel from their posture and movement, and to be honest, Hunter Prey feels like a particularly good Heavy Metal strip brought to life. My only gripe is that the movie doesn’t really end in the strictest sense, but it still works. If you’re looking for a fun sci fi action flick, check this one out.